Much is made of the crypto bubble, crypto crash and so on as bitcoin prices peaked at almost $20,000 in December 2017 and plummeted about 70 percent since. But looking beyond the price, this new asset class is doing just fine. For starters, even with the volatility in the product and the bearish moves, bitcoin continues to capture the attention of market participants and beyond. CME Group’s bitcoin futures contract gained on the Cboe Global Markets version in terms of volume, but it is still early days. Both contracts are just months old, each launching in December 2017. Strong volatility in the markets pushed futures CME volumes above 12,000 contracts on July 26 with its Q2 average daily volume at just over 3,500 contracts, up from 1,854 contracts per day in Q1. Cboe averaged around 5,100 contracts per day in Q2, down from 7,100 contracts per day in Q1. The CME futures contract is based on its CME CF Bitcoin Reference Rate, which aggregates bitcoin prices from several spot exchanges with each contract representing 5 bitcoins. (Think of it similarly to CME corn futures representing 5,000 bushels of corn.) The Cboe contract is based on bitcoin prices from one spot exchange, Gemini. And each contract represents one bitcoin. In other words, Cboe futures contract is smaller than the CME contract. Today, investors are looking at bitcoin futures for a variety of reasons. Futures trade and are settled and cleared in US dollars, so entry and exit of the market is easy and efficient. The futures markets also allow traders to easily go long or short in the market. And the price relationship between the spot market and the futures is quite tight. These efficiencies have drawn in substantial professional and institutional trading firm interest. The asset class is still very young so correlations to other markets are still being established. But so far, bitcoin has low to negative correlations to bonds and commodities such as gold, making it a possible addition to a portfolio. And some traders just like the volatility of the product. The fundamentals that drive bitcoin prices is also a work in progress and include things such as: the amount of energy and calculations needed to mine for bitcoin, the ownership data (it is rumored the founding members of bitcoin own 3- to 5 million coins) and number of bitcoin transactions each day. And there is more happening at the exchange level. CME launched the CME CF Ether-Dollar Reference Rate in May on ethereum prices, which may become a second futures contract eventually. Meanwhile, the Intercontinental Exchange introduced a new market in August called Bakkt, which plans to launch a 1-day physically delivered bitcoin futures contract in November. Having three major exchanges in the sector is interesting with each trying different contract specifications and an aim to grab new participants. The number of institutional players also is increasing. 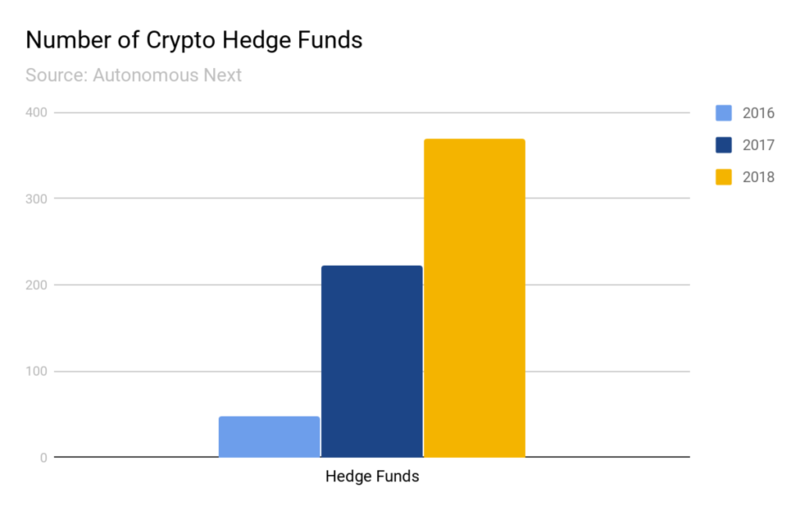 Autonomous Next, a website which follows the number of hedge funds, exchanges, advisors and others in the crypto space, counted 370 hedge funds today, up from 223 in 2017. The Barclay Cryptocurrency Traders Index had 19 funds in it when it was launched in April 2018, 29 CTAs in June and 25 in July. There also has been much talk about a bitcoin or cryptocurrency exchange traded funds (ETFs). The Securities and Exchange Commission has so far rejected such applications, the latest thumbs down occurring in August. But there is still optimism among exchanges that ETFs will be approved eventually. If so, ETFs could create a flood of new participants in the markets and increase demand for hedging on futures exchanges. Away from the headlines about bitcoin prices, there are massive infrastructure projects underway that could substantially increase institutional participation in these markets. So far, a big drawback for many hedge funds, commodity trading advisors and asset managers has been the lack of traditional financial market infrastructure for the underlying markets. Some of it has been on order execution, speed and access but much has centered around custody services – which safely and securely hold bitcoin, ethereum and other cryptocurrencies. Many participants equate custody with electronic wallets for digital assets, but traditional FCM custodial services go well beyond storage: trade settlement, tax, income collection, accounting, regulatory reporting and secure information aspects as well. And here is where the established world of financial services has a centuries head start on the new digital asset space. One of the challenges in the cryptomarkets custody space is efficient access to the assets. As each spot exchange is different, customers are often stuck putting money in one exchange’s wallet system and more in another, and so on. This is not only inefficient but may leave some capital vulnerable to hackers if a spot exchange does not have strong enough security. There is a dearth of tier-one names in this space. Coinbase, one of the largest crypto trading platforms, just began accepting assets from institutions in August with a professional-grade service called Coinbase Custody. But the pioneering custody market will soon be joined by some established names such as Goldman Sachs, The Northern Trust and Nomura. The Intercontinental Exchange’s Bakkt, which will handle cryptocurrency futures trading, aims to provide warehousing services. Bakkt also plans to expand into consumer purchases. Each of these companies are in various stages of development but in terms of custody services, the space is much further along than it was just several months ago. The coming months will help illustrate just how far custody services have advanced in terms of speed, functionality and services. Meanwhile, more obscure but crucial work is being done on the access side of the business. The FIX Trading Community, an organization focused on the protocol, has been focused on establishing guidelines or standards for spot cryptomarkets through its Digital Currency Working Group. A set of standards for FIX APIs could make it easier for institutional firms to connect to various venues. This marks a small snapshot of today’s crypto markets. New infrastructure and advances are happening with regularity now in the race to attract new users. The regulation continues to be a major hurdle, but futures and securities regulators are looking at the space and offering guidance. The rule set is slowly being developed. With new crypto roads, tunnels and bridges being built, it may not be long before this marketplace’s ecosystem is bustling with retail, commercial and institutional traders.